I was at a Burnley Football Club function in the summer of 1983 when one of the club directors came up and told us we'd signed Joe Gallagher from West Ham in a deal that was only costing us £30,000. Gallagher was an established top division centre half, he'd played over 300 league games in his career and was still just 28 years of age. He signed a four year contract with the Clarets and on the surface it appeared to be something of a coup for what was going to be a new look Burnley under John Bond. Liverpool born Gallagher was in demand after his exploits as a schoolboy footballer. He played alongside Billy Rodaway in a Liverpool boys team that lifted the English Schools Trophy in 1970 and whilst Rodaway made Turf Moor his destination Gallagher moved to St. Andrew's to sign for Birmingham City. He made his first team debut for Birmingham at Arsenal in October 1973 whilst just 18, playing alongside Kenny Burns and from then on he was a regular in the Birmingham side. For six seasons he partnered such as Burns and Colin Todd in the top flight and played in the FA Cup Semi-Final in 1975 against Fulham. He scored in that game too, but it ended in a draw and Birmingham lost the replay. Birmingham were relegated in 1979 but bounced back a year later although that 1980/81 promotion season proved to be his last for the club. He'd played over 330 league and cup games for the Blues and was granted a testimonial game against Aston Villa. But in the summer of 1981 he opted for a move to Wolves. The fee was £350,000 although Birmingham were never to see most of that money. Wolves were in problems and were declared bankrupt in 1982 with much of that fee still owing. They were desperate and dispensed with Gallagher who was one of the top earners. They forced him into the reserves, replacing him with the young John Pender, and then cancelled his contract for failing to turn up for the taking of a team photograph. Simply they were doing no more than getting him off the wage bill and came up with any old excuse to do so. 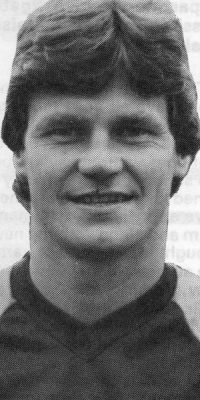 He'd been with Wolves for not much over a year and for two months he was unemployed before signing a deal with West Ham that saw him play for them for the remainder of the 1982/83 season. That's when Burnley stepped in to offer him this long term contract and on the surface it looked to be one hell of a signing. My first sighting of the new centre half was in the Isle of Man as the team arrived for the first game of the pre-season tournament against St. Mirren. As they walked across the pitch it was clear Gallagher, walking with a limp, was injured so it was something of a big surprise when he lined up in the side that night. Joe had suffered injuries and that's how it was to be for him for now on. It looked as if we'd signed a crock. He was in the side for the first league game of the season however at Hull but was promptly dropped after the Clarets suffered a 4-1 reverse. He played in the home leg of the League Cup tie against Crewe but that was it in his first season with Burnley, just two appearances. With Vince Overson fit again he came back into the side. Manager Bond was not happy with the situation and tried to get his contract cancelled because of his lack of fitness. He pointed the finger at Burnley's medical staff, and at his old club West Ham, but after independent medical examinations Gallagher was passed fit. Bond banished him to Halifax on loan but after a month he returned to Burnley where he had to settle for reserve team football. With Bond gone he was used far more regularly by John Benson in the following season, he started four games, twice as many as the previous season. The next two managers, Martin Buchan and Tommy Cavanagh, didn't consider him at all for the first team. He joined the coaching staff, presumably so we would get something out of him whilst he was still with us. It was some sight on Cavanagh's first game in charge to see him and Gallagher making their way to the dug out, then in front of the Longside. With Gallagher's limp and Cavanagh's struggles with his hip it said much about the state of our club. His playing days at Burnley weren't over though by any stretch of the imagination. Such was the squad Brian Miller had to work with when he returned that he played Gallagher virtually throughout the 1986/87 season that culminated in the Orient Game. Joe missed just five games that season and he scored three goals, two of which were vital. He got the winner in a shock home win against Northampton and also scored in the ultra important 2-0 Easter win at Rochdale. He was in the side that beat Orient on that last day of the season but with his contract at an end there was no way was getting a new one. That Orient game proved to be his last in league football. At the age of 32, when released by Burnley, he retired. Joe moved into the pub trade in Clitheroe for a while whilst playing some non-league football, but he eventually moved back to the West Midlands and rejoined Birmingham City via their community programme and also managed non-league clubs in the area. Today he can still be found at St. Andrew's involved in corporate hospitality on match days. Joe Gallagher's time at Burnley wasn't the success we thought it was going to be on the day he signed. That injury really had restricted him, and with today's requirements there's no doubt West Ham would not have been able to sell him as easily as they were then. Despite that, it has to be said he was one terrific person to have around the place and he was a big friend of the Supporters' Club and there were many, many young Burnley fans who were then members of the Junior Clarets who knew him as Uncle Joe. No player had ever been so supportive of the young fans. But simply he was a poor signing because he was no longer up to playing football at League level.